Addressing the European Parliament in Strasbourg, the European Commission president said he was "astonished" at Prime Minister Theresa May's inability to get the package agreed with the EU last month through the British parliament. After calling off a parliamentary vote on the deal planned for Tuesday, Mrs May has spent the day in talks with fellow leaders including Germany's Angela Merkel and Mark Rutte of the Netherlands. The issue of the Irish backstop - the back-up plan to avoid a hard border between Northern Ireland and Ireland if a free trade agreement can not be reached before the end of the transition period - remains the most significant hurdle to securing parliamentary support. It was reported on Tuesday night Sir Graham Brady, chairman of the Conservative committee that overseas leadership challenges, has requested a meeting with the PM on Wednesday afternoon to inform her he has received the 48 letters of no confidence needed to spark a vote. The delay to the so-called "meaningful vote" by MPs means that ratification may not be possible until as late as 10 weeks before the scheduled date of Brexit on March 29. May said on Monday that "nothing should be off the table", but warned that reopening the withdrawal agreement could see other countries seek to remomve bits they do not like, for example on fishing rights. She questioned whether parliament was trying to frustrate the democratic will of Britons to leave the European Union and warned that without agreement the world's fifth largest economy would leave on March 29 without a deal. But she was dealt a blow as European Commission president Jean-Claude Juncker declared there was "no room whatsoever for renegotiation" of the Withdrawal Agreement reached last month. For Gibraltar, reopening the deal could raise the prospect of Spain seeking to modify the legal text to strengthen its hand over Gibraltar's inclusion in any future trade deal between the United Kingdom and the EU. France's European Union affairs minister, Nathalie Loiseau, on a visit to Brussels, suggested her country's president, Emmanuel Macron, would urge the EU's leaders at a summit starting on Thursday to take responsibility for their own preparations rather than be sucked into May's domestic political drama. 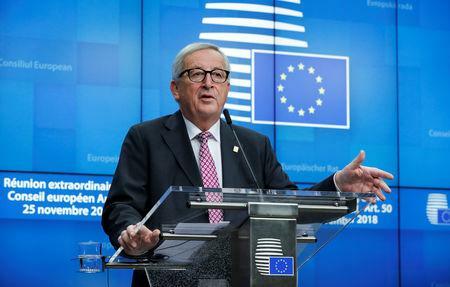 Mr Juncker said the agreement was the "best deal possible" and the "only deal possible". "The government has lost control of events and is in complete disarray", he said. May want to test the waters in Berlin, on what concessions they can hope for. "We will put down a motion of no confidence when we judge it most likely to be successful", a party spokesman said. "During Prime Minister May's speech to the House, sterling fell through Dollars 1.26 to trade (at) levels not seen in 20 months, bringing the 2017 lows at USD 1.19 into focus", ETX Capital analyst Michael Baker told AFP.